PTA meetings can get out of hand rather quickly. 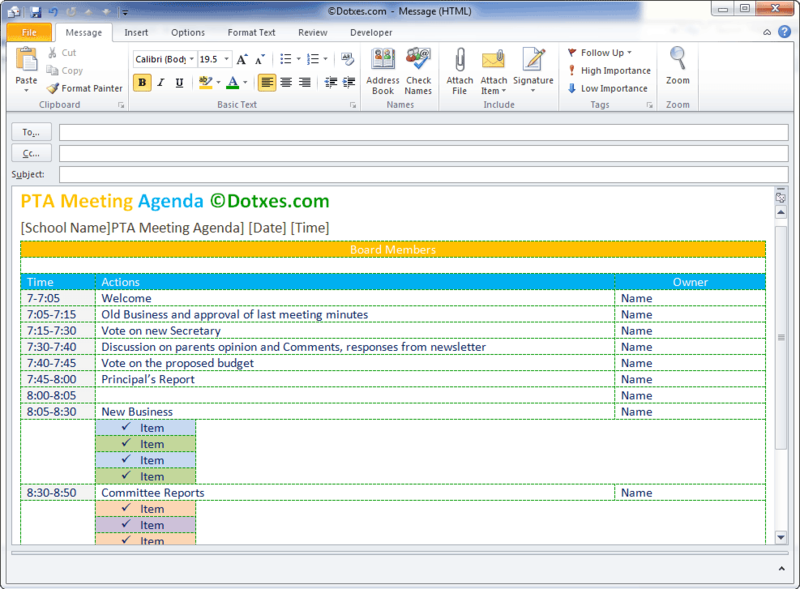 If you want to keep things organized and keep the meeting on task, you can send an agenda to the attendees prior to the meeting. This PTA meeting agenda template for email use allows you to do just that in a quick and easy manner. Be sure to fill it out fully – including listing all of the “old” and “new” business that you are going to discuss in the proper sections. Figure out the amount of time that will be needed for each discussion, and include those times in the template so that everyone knows just what is going to be happening when. Include the school name and the date and time of the meeting at the top of the page, so everyone knows where this is taking place and what time it is happening. Be sure to send the template to all of the attendees ahead of time, so that they can look it over and know what is going to be taking place. Proofread what you have written before sending the agenda off.